The Dividend Achievers index includes companies that have increased annual dividends for at least 10 consecutive years and have met specific liquidity screening criteria. Companies that are included in the Dividend Achievers index typically generate strong cash flows, have solid balance sheets and a proven record of consistent earnings growth. These characteristics typically make these companies attractive takeover targets. American General (AGC), which was acquired by American International Group (AIG) in 2001. The company had increased dividends up until the merger was finalized. Rouse Co (ROUS) was acquired by General Growth Properties in 2004. The company had increased dividends up until the merger was finalized. Bank South Corp (BKSO) was acquired by Bank of America (BAC) in 1996. The company suspended its dividends July 1991, after suffering from large losses. The dividend was reinstated in 1993. Pall Corporation (PLL) manufactures and markets filtration, purification, and separation products and integrated systems solutions worldwide. 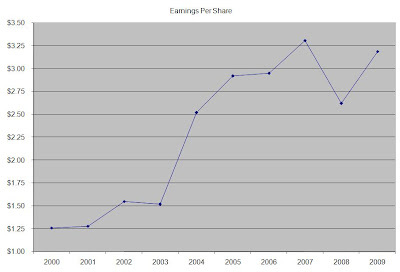 Pall Corp (PLL) stopped raising dividends in 2002 and then cut distributions by almost 50%. The yield on cost today of an early 1991 investment in the stock would be 4%. One dollar invested in December 1990 would be worth 3.29 dollars today. Crawford & Company (CRD-B) provides claims management solutions to insurance companies and self-insured entities worldwide. 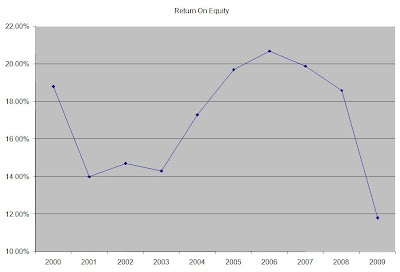 The company cut dividends in 2002 and eliminated the dividend payment in 2006. One dollar invested in December 1990 would be worth 64.40 cents today. Wrigley Wm Jr (WWY) was acquired in 2008. The company had increased dividends up until the merger was finalized. Berkshire Hathaway (BRK.B) provided financing for the acquition. Black Hills Corporation (BKH), together with its subsidiaries, operates as a diversified energy company. It operates through two groups, Utilities and Non-regulated Energy. The company is still a member of the dividend achievers index. The yield on cost today of a December 1990 investment in the stock would be 17.10%. One dollar invested in December 1990 would be worth 10.92 dollars today. Central Fidelity Banks (CFBS) was acquired by Wachovia (WB) in 1997. The company had increased dividends up until the merger was finalized. American Precision Industries (APR) was acquired by Danaher (DHR) in 2001. The company was deleted from the index in 1997 after it failed to increase dividends. The Laclede Group, Inc. (LG) operates as a public utility holding company providing natural gas service to approximately 630,000 users in St. Louis. The company failed to increase its dividend in 1992, just one year after being admitted in the index. The yield on cost today of a December 1990 investment in the stock would be 10.50%. One dollar invested in December 1990 would be worth 6.48 dollars today. KeyCorp (KEY) operates as a holding company for KeyBank National Association that provides various banking services in the United States. 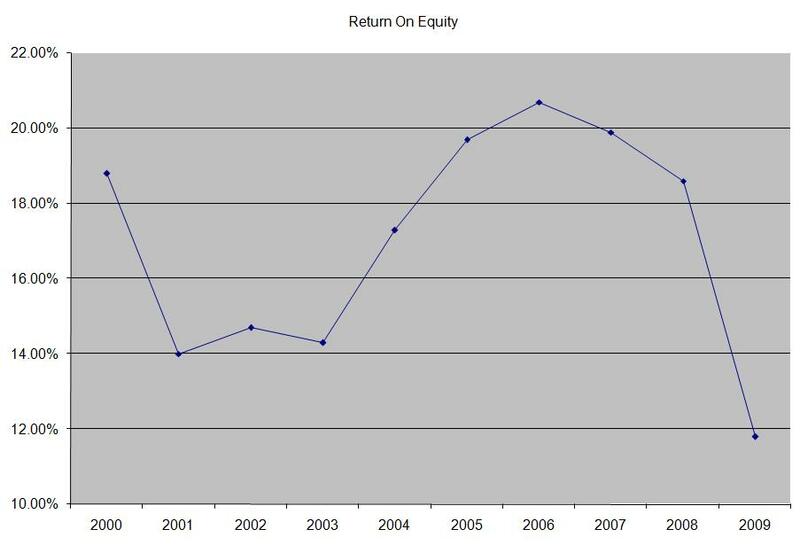 The company cut dividends in 2008, amidst the worst financial crisis since the Great Depression. The yield on cost had reached 27.10% by 2008; after the cut it went down to 0.70%. One dollar invested in December 1990 would be worth 3.32 dollars today. Boatmen’s Bancshares (BOAT) was acquired in 1996 by Bank of America (BAC). The company had increased dividends up to the merger was finalized. St. Joseph Light & Power (SAJ) was acquired by Utilicorp (UCU) in 1999. The company had increased dividends up to the merger was finalized. CLARCOR Inc. (CLC) provides filtration products and services to customers worldwide. It operates in three segments, including Engine/Mobile Filtration, Industrial/Environmental Filtration, and Packaging. The yield on cost today of a December 1990 investment in the stock would be 10.80%. One dollar invested in December 1990 would be worth 15.70 dollars today. OGE Energy Corp.(OGE) , together with its subsidiaries, operates as an energy and energy services provider offering physical delivery and related services for electricity and natural gas primarily in the south central United States. The company failed to increase distributions in 1992, just one year after being admitted in the dividend achievers index. The Oklahoma Gas & Electric utility didn’t start raising dividends again until 2007. The yield on cost today of a December 1990 investment in the stock would be 13.50%. One dollar invested in December 1990 would be worth 15.00 dollars today. Source Capital, Inc. (SOR) is a close-ended equity fund launched and managed by First Pacific Advisors, LLC. The fund invests in the public equity markets of the United States. The yield on cost today of a December 1990 investment in the stock would be 6.60%. One dollar invested in December 1990 would be worth 6.50 dollars today. The company failed to increase dividends in 1991. IE Industries was acquired in 1997 by WPL. The company had increased dividends up until the merger was finalized. Colonial Gas was acquired in 1999. The company had increased dividends up until the merger was finalized. The results of the 1991 additions are really stunning. Out of 20 companies that were added to the dividend achievers index only 2 are still its members - CLARCOR Inc. (CLC) and Black Hills Corporation (BKH). However, half of those additions became takeover targets. Of those ten acquired companies, only two stopped paying distributions before they were acquired. Five companies eventually cut distributions – State Street (STT), Key Corp (KEY), Source Capital, Inc. (SOR), Crawford & Company (CRD-B) and Pall Corporation (PLL). The remaining companies either maintained distributions or raised them sporadically over the next 19 years. Stay tuned for my article next week, when I will discuss how to profitably exploit the findings of this research. Over the past two years, the yields on most investment grade fixed income securities have declined substantially. Investors who need to generate income in retirement are running out of options. 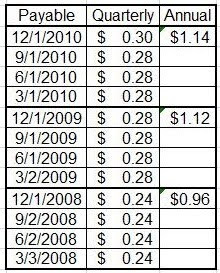 For example back in 2006 and 2007 the yield on US 10 year Treasury note was almost 5%. Currently the yield on US 10 Year Treasury note is less than 3%. As a result many investors are focusing their attention to blue chip dividend stocks these days. There are many solid Blue chip stocks which yield more than fixed income. In addition to that solid dividend stocks could also afford to increase the dividend payment, which offers protection against inflation. Thus, investors could either tie up their money for a prolonged period of time in bonds or they could purchase dividend stocks which provide a higher yield as well as the possibility of dividend growth to outrun inflation. 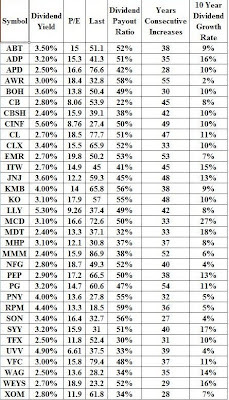 Finding the best dividend stocks does require some research however. Investors should evaluate whether the company researched has the ability to raise earnings for the foreseeable future. Investors should then make sure that they are not overpaying for the shares. The sustainability of the dividend payment is important as well, since a well covered dividend could withstand short-term earnings fluctuations much more easily than a not so well covered payment. In addition to that, by focusing on companies with a strong culture of paying higher dividends for at least ten consecutive years, investors would be increasing their chances of generating income in retirement that at least keeps up with inflation overtime. While dividend stocks would likely produce total returns that are higher than purchasing fixed income today, bonds still should have a place in a retirement portfolio. An allocation to US Treasuries would have protected one’s portfolio during the Great Depression or during the most recent financial crisis. Ensuring that your portfolio lasts a lifetime should be much more important than focusing on one asset class. 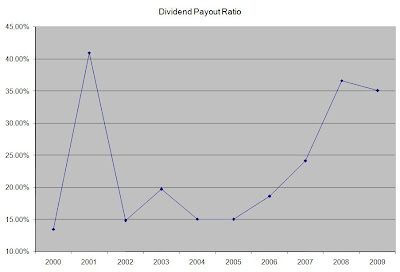 Blue Chip dividend stocks would provide inflation adjusted stream of income over time, while even a modest 25% allocation to bonds purchased over time would provide payout stability in the event of a deflation or during an economic recession coupled with low inflation. In addition to that stocks are inherently riskier than government bonds, and as such there is a possibility of losing principal invested. This article was included in the Carnival of Personal Finance #272 – Yogi Berra Edition! 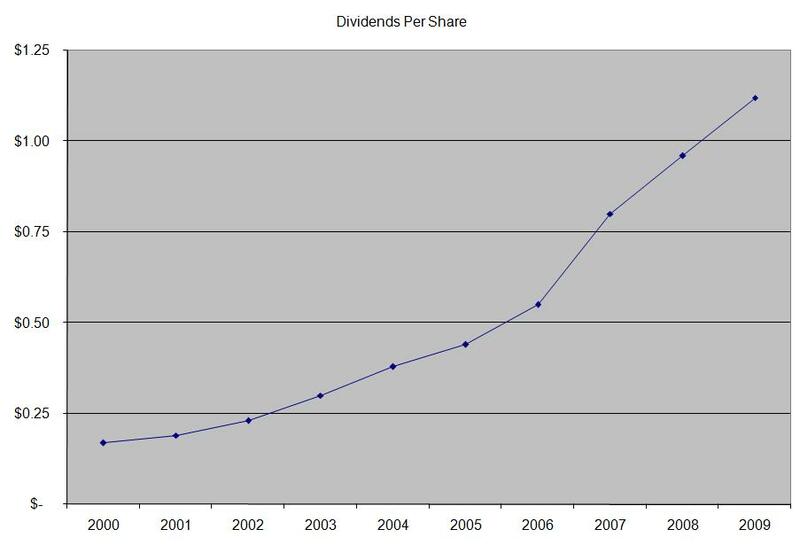 Few companies have managed to raise dividends for several consecutive years in a row. For example there are fewer than 300 companies listed on US exchanges which have raised distributions for more than one decade. Of particular interest to many dividend investors are companies which are able to raise earnings, which fuels future dividend growth. As a result, investors in those companies have much better chances of generating an income stream which meets or exceeds the rate of inflation. 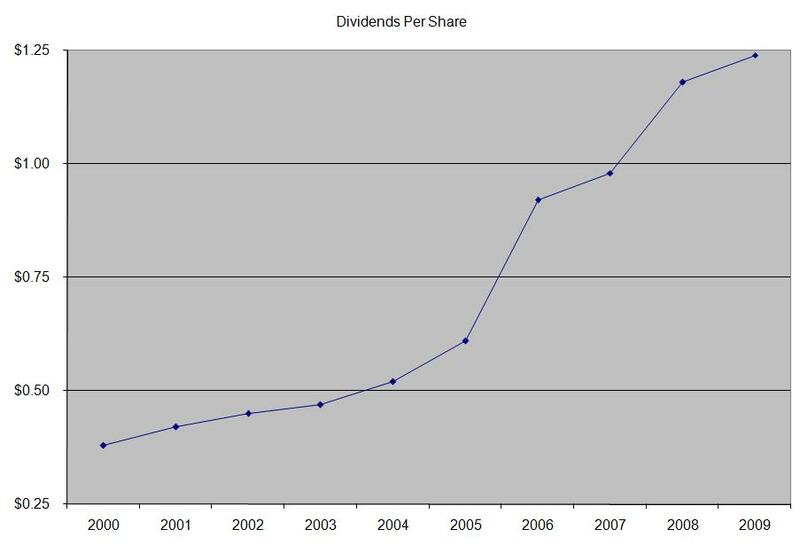 Aflac is an example that a company does not need to raise dividends every year, in order for it's annual dividend payment to increase. 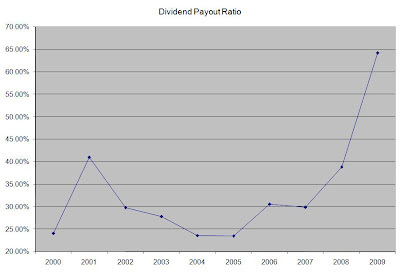 The quarterly dividend was last raised in the first quarter of 2009, and remained unchanged for the next seven quarters. 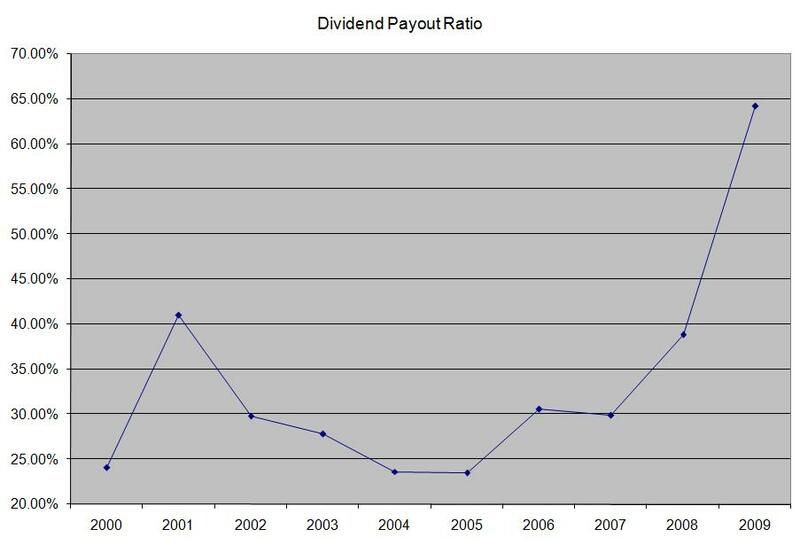 The annual dividend still increased, mostly helped by the most recent dividend increase. 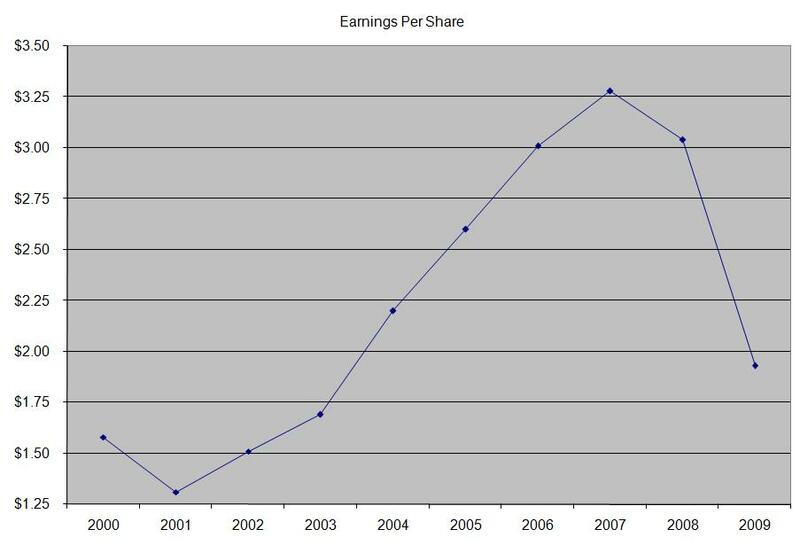 Earnings per share have increased by 7.90% per year over the past decade. 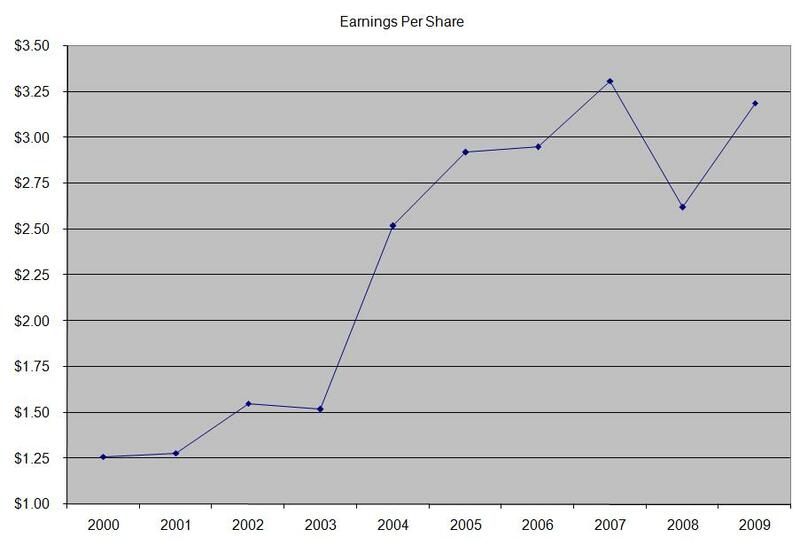 Since 2004 however the company has delivered no growth in earnings. The earnings picture is expected to further deteriorate in FY 2010 and FY 2011, as earnings per share are expected to contract to $2.21 and $2.44 respectively. The reason for the decrease in earnings include CareFusion Corp’s (CFN) spinoff, decrease in drug volumes due to the recession and a shift of significant amount of the drug volumes to fee-for-service compensation by most drug makers. Longer term drug volumes would increase, as the population ages and as millions of baby boomers will need increased medical attention. With increased penetration of low priced generic drugs being available in the market, revenues could be further depressed. One positive of generic drugs is that margins are higher in comparison to branded drugs. The problem is that the prices of generic drugs are much lower than prices for branded drugs. Many investors have been told that buy and hold does not work anymore. With almost everyone glued to screens streaming real-time quotes, news and charts and with so many institutional investors having extremely short term timeframes, one would certainly believe that buy and hold investing is a dinosaur strategy. Over the past decade stock prices have been extremely volatile, which has led many to believe that short term trading is the answer. Even those who purchased shares in quality companies one decade ago such as Coca-Cola (KO) or Wal-Mart (WMT) didn’t perform better. The main reason for the low returns over the past decade was the fact that in the late 1990s investors forgot about fundamentals and bid up stock prices to unsustainable levels. The price/earnings ratio on the S&P 500 index increased to 30 times earnings, which was twice the average of the preceding eight decades. Thus investors were betting that earnings would keep increasing at a faster rate over the future. While stock prices were much overvalued at the beginning of the decade, some businesses managed to increase revenues and profits. 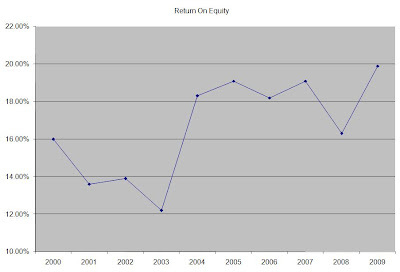 The consistent increases in profitability have made many quality stocks that were overvalued in 2000 attractively valued. The only returns that buy and hold stock investors in those stocks generated came from dividends. This provided positive feedback to investors during two of the bear markets of the past decade. 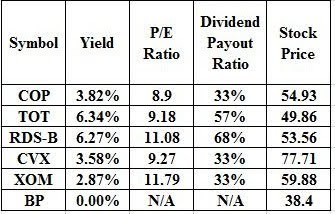 While yields were low due to the market being overvalued, quality companies kept raising dividends, which raised the yield on cost to original investors. If investors also managed to reinvest those dividends consistently, they would have been able to capitalize on any market weakness and further compound their dividend incomes in the process. Despite the increasing noise in the markets, buy and hold investing does work. Investors who dismiss buy and hold investing altogether due to the poor performance over the past decade might be missing out on some great opportunities. 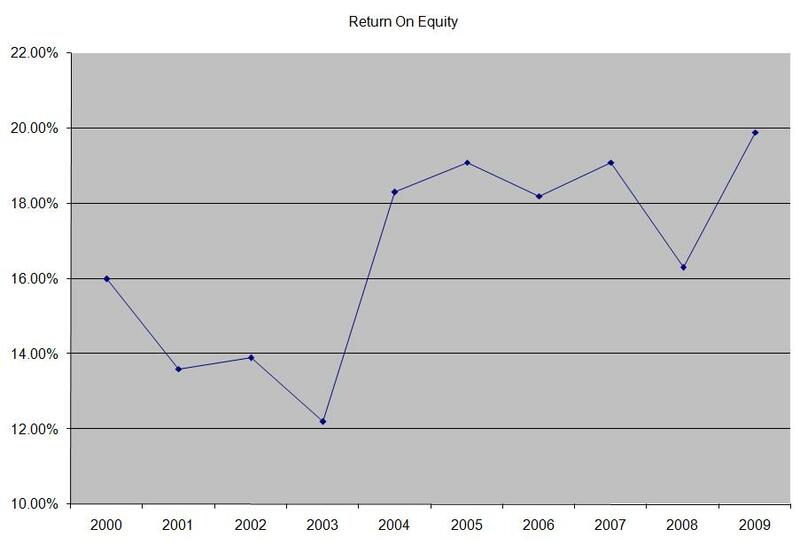 Most of the quality dividend companies that were overvalued in 2000 are still quality businesses. Those businesses are attractively valued today, and yield much more than what they did in the year 2000. These businesses are also still growing, which means that investors should expect strong dividend growth in the future, which would increase their yield on cost. 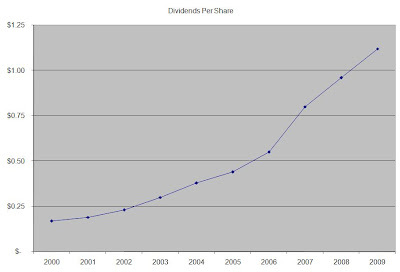 In addition to that, by reinvesting dividends, investors would be able to further compound their dividend income.